This newly released, micro-production of Russian River Valley Pinot Noir coming from Silver Eagle Vineyard is everything I hope for in a Pinot. I was first introduced to single-vineyard Silver Eagle Pinot through Matt Courtney's Ferren Wines and I'm now a believer that it is one of the best vineyards for sourcing great Pinot Noir. 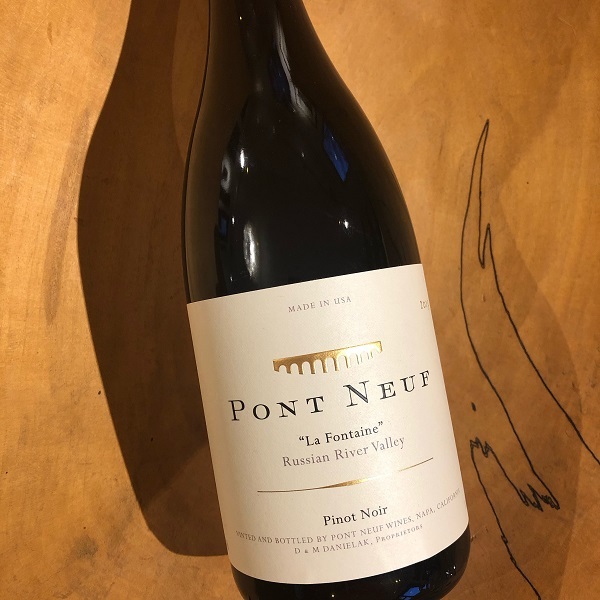 This is the newest vintage for Pont Neuf vintners and winemaker Mary and Doug Danielak and it is every bit as impressive as the 2015. "La Fontaine" transitions e?ortlessly from enticing aromas of cassis and fragrant ?owers to savory spices and earth enveloped in black fruits. The seamless texture helps carry the aromas and ?avors in a graceful and timeless way. A deep ruby color and tightly wound core of bold fruit suggests this wine will age gracefully for 15 years or more. The Pinot Noir selections in this single vineyard wine originate in Chambolle Musigny and Vosne-Romanee. Those two sub-regions tend to offer some of the most powerful yet elegant Pinot Noirs in the world. 50 cases were produced. Copyright © 2019 K. Laz Wine Collection.